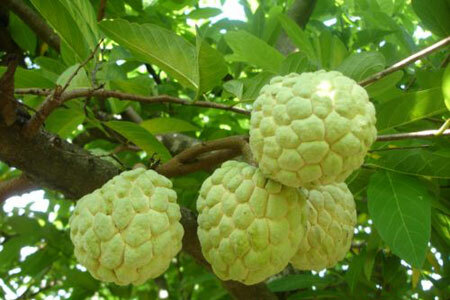 In Viet Nam, there are two kinds of custard apple: firm and soft. Both varieties can have various shapes, for example they can be round or oval. When a custard apples is ripe, it is easy to peel. The peel is thick, green, and covered with white or green pollen. The pulp is white or light yellow and contains many black seeds. In the south, custard apples call mang cau, ripen in July, but not all at the same time. Firm custard apples are densely grown in the south, mainly in Ninh Thuan and Ba Ria - Vung Tau provinces. Xiem custard apples are oval or heart shaped. Their peel is green with thorns, which turn black when the fruit is ripe. The fruits are generally big and can reach 1.5 kg. The pulp is white, hard, and a bit sour. Custard apple trees deliver fruit after three or four years of growth. A tree produces on average from 50 to 100 fruits per year. The fruits ripen on the tree and then cracks, especially during the rainy season.